Personal hygiene, how to survive without power is the topic of the day. 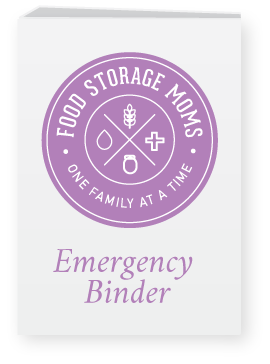 In case you may have missed some of my posts, I am often asked to speak to different church groups, businesses, and neighborhoods about emergency preparedness and food storage. I hired a friend to take professional pictures of my emergency preps, cooking devices, wash tubs, emergency toilets, emergency cooking stoves, and fuel, to name a few. I am no longer able to physically carry everything with me to all the classes or presentations. I’m not sure how much longer I’ll be able to continue to do these presentations. I’m honored to be able to teach when I can to get the word out about being prepared for the unexpected. 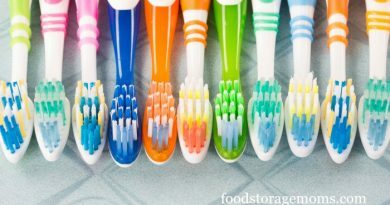 Today, let’s talk about personal hygiene. I’m so thankful to my reader who I call a friend, Joanne for asking me to put a “print” button on my website. I want people to be able to print my articles and teach others in whatever manner they feel comfortable. You are welcome to share my pictures and teach your family, friends, and neighbors. 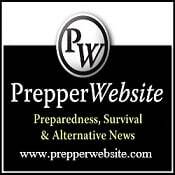 I realize some people “get it,” but many are not interested in any preparedness items or having food storage, which I think is too bad. Somehow we need to help others to be prepared for the unexpected. After a disaster, the government may not be able to bring supplies for 3 days, 3 weeks or 3 months, depending on the type of disaster, where you live, and the government agencies assigned to work in your area. A few years ago I talked to my sister in Texas who at the time lived near where Hurricane Harvey was a Category 4. She said the gas pumps were empty, the store shelves were empty and no one could buy any water. 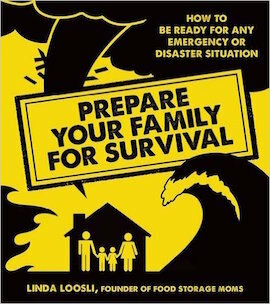 I remember calling my sister to check on their family before the authorities started evacuations. She called friends in other cities in Texas and they were in the same predicament. Here’s the deal, in some areas near Hurricane Harvey they were asked to evacuate or try to get supplies, if possible before the storm hit their location. I heard the City Manager in one city ask those people who declined to evacuate to please write their social security numbers on their arms so they could be identified after the storm. I took a double take on that one. I had to rewind the DVR to make sure I heard that right. Here’s the deal, we never know when our neighborhood, city or county may have a disaster just like Hurricane Harvey. 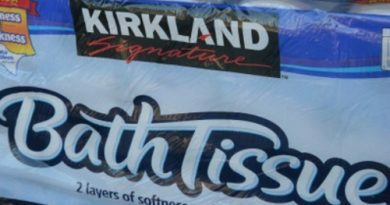 There are certain things we want after a disaster like we at least want clean underwear, right? I think we can all agree on that one. I have seen fancy wringer washers from different stores, I have not purchased one of those yet. It’s on my wishlist, but here are a few ways to wash our clothes without any power. In most cases, we may lose power after a major, or even a minor disaster. 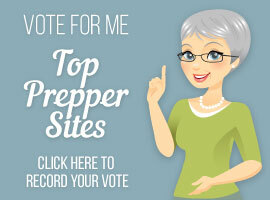 I hope you can use some of these ideas for those unexpected disasters. The water lines may even become contaminated, but I’ll talk about that another day. Just so you know, the American Red Cross recommends storing one gallon of water per person per day. I disagree. 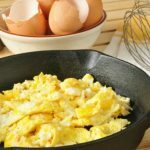 That amount is fine if you only want to hydrate yourself, but what about washing dishes, washing our underwear and cooking with dehydrated or freeze-dried foods? I highly encourage you to store 4 gallons of water per person per day. 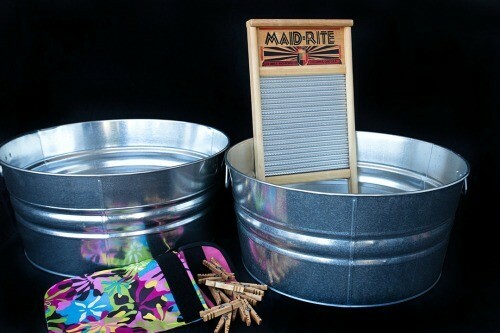 Those shown below are Behrens wash tubs I purchased on Amazon and the washboard I found at a thrift store. The clothespins are made by Kevins Clothespins. I have purchased many brands of clothes pins that fell apart after using them once, this brand is the only one I can endorse. You may have seen the post I did on making these emergency washing machines shown below. This set basically takes two 6-gallon buckets, one we drilled holes in so there would be a bit more friction when washing or rinsing clothes. You need one Gamma lid (we drilled a 2-inch hole in the top) with one mobile washing tool with a handle. I place paper towels between the buckets when stored. They are impossible for me to separate them without that buffer. I did a YouTube for a company called Earth Easy that they use on their website. They sent me the clothesline to try and I highly recommend one. I can close it and store it when not in use. It’s perfect for the HOA I live in. If you already own a clothesline, I tip my hat to you! Thank you for being prepared. You’re going to need it, I promise. The picture below shows the difference between a 5-gallon and 6-gallon emergency toilet. The older you get the harder it is to squat down on the lower toilet. 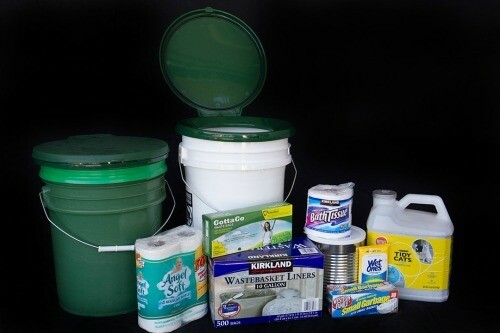 Here are some things you will want to store inside your emergency toilet: hand sanitizer, toilet paper, 10-gallon bags, kitty litter or sawdust. The #10 can potty is a post I wrote for emergency toilets in cars. And don’t forget the toilet seat. This emergency toilet was made by a nephew, Dayne. I’m having a friend make one for me and hope to share the instructions on how to make one. This one uses a regular toilet seat that is attached and a 6-gallon bucket. 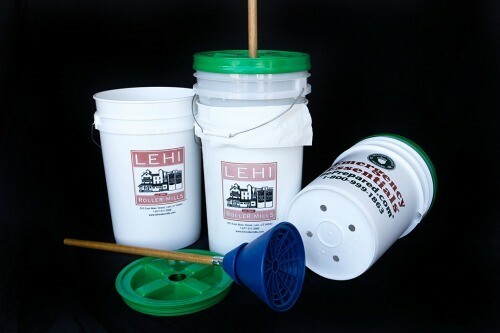 If you are handy you can probably build your own around the bucket. Dayne even attached a toilet paper holder on the side. When I saw this, I almost did a cartwheel, or at least I wished I could do one. I was so excited to see this design. This picture below shows an approach anyone can make in their own home. Please duct tape the handle so the little ones do not try and flush the large black 30-gallon garbage bag down the sewer lines. 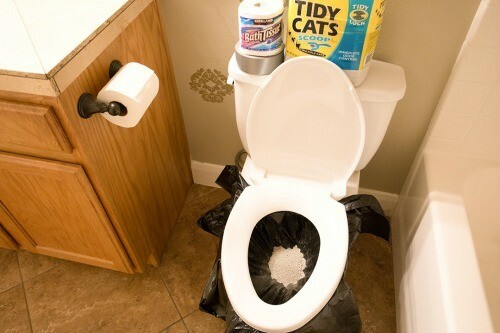 All you do is lift the toilet lid and seat, place the bag in the toilet base and fill with kitty litter. Rose reminded me about storing baby wipes! I wrote a post about baby wipes. Remember even if they dry out, you can fill the container with a little water and they work fine! If you do a “navy shower” (get wet, turn off the water, soap up, rinse down as quickly as possible) you can get a really nice hair wash and shower with a gallon of water. 2 is luxurious! 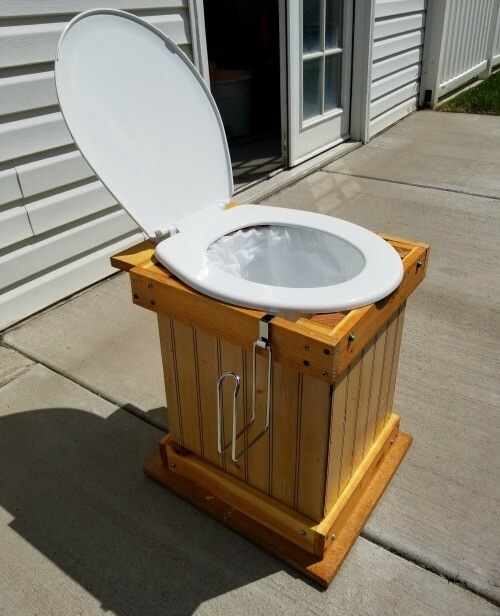 I have wheat buckets so I decided to save money and make my own toilets. Thanks again for being prepared for the unexpected. May God bless this world at this time. We need it more now than ever before. Yes, you can survive without power because you are ready and realize you can’t depend on the government. They can’t begin to take care of everyone, as we have seen after several disasters. We must take care of ourselves and be self-reliant. Do you think we can survive without power? Yes, we can. I applaud the city manager for having the forethought to tell people to write down an identifier. If you’ve ever had the displeasure of a swollen water logged body…. I still wear dog tags when hiking and hunting. I’ve got a toilet wth it’s own stand that doesn’t require squatting. I’ve got the camper and a bucket lid one in the storm shelter. I’ve got a clothesline but no “washer” yet. A little side note. Apparently mice will eat soap. Little sucker got mine in the gym locker at work. I’ve decided to put my stores in a container. Specifically it was Irish spring. I’ve never had one eat the homemade stuff. Matt – funny you say that the mice ate the Irish Spring. That is the one brand of soap that my car dealership told me to put in my car to repel mice! I took a plastic container and drilled several small holes in the lid, shaved IS soap and placed in the container and under the seat. Car smells really nice now! Linda ~ I would take the Personal Hygiene a bit further. I do want clean undies and a place to “go” but I want and will need more, much more! I have a washing set up already and a bucket toilet. I use both when I go camping at a 10 day camping trip that is off grid – no running water (unless there happens to be a stream close by) and no electricity. I have been doing this kind of camping for well more than 40 years. But, while I can wash clothing while I am camping and don’t have to find a tree to squat behind, I really want to make sure that I can keep my body clean. I mean, why bother with clean undies if I am just putting them on an unclean body?? I make my own cleansing cloths: I cut a “select-a-size” roll of paper towels in half. I then remove the cardboard tube. I have a fairly deep plastic container with a tight fitting lid. I push the paper towels into this container. In a pitcher/large measuring cup, I combine distilled water and a few drops of castile soap. I pour this over the paper towels. I don’t want the towels drowning in fluid but enough to saturate the roll. Then, when I am camping, I open the lid, pull out a couple of towels and can do a body clean. I have been asked before how I stay clean when camping and I have shared this. I think I found it on Pinterest but cannot locate it if I saved it!! Also, when I am camping (it is only once a year that I go for 10+ days) I use the Double Duty bags that I find at camping stores. They fit the “Luggable Loo” bucket toilet. I find them convenient for disposal. For the long term in the event of an emergency, I would suggest the really large zip type bags for getting rid of human waste (or at least to prevent spillage). – just a suggestion. I know that if one has a family they are dealing with, that might get very expensive. My “toilet” for my E-preps has 3 boxes of Large zip bags along with the heavy duty garbage bags. Another thing that I store in that toilet is the RV toilet deodorizer in powder form. It reduces odors! 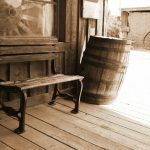 There are many aspects to personal hygiene and your post will hopefully lead people in the direction we want them to go – PREPARE! NOW! Each person needs to determine what personal hygiene means to them. For me, it is a way to keep my body clean, clothing clean and all of the other ways of cleanliness that I want and need to stay sane! @Leanne lol I actually looked it up and sure enough they are attracted to that brand. Another handy item is a pump up pressurised camping shower. Also good for hosing things down as long as you’re not on limited water. If you do a “navy shower” (get wet, turn off water, soap up, rinse down as quickly as possible) you can get a really nice hair wash and shower with a gallon of water. 2 is luxurious! There are various types or you can use a new garden sprayer that’s never had chemical sprays in it. Mine is metal and meant to heat water right in it. There’s even a coil attachment so you can heat water in a fire. There are some battery operated shower hoses that you can use with any container. Any long term camp with decent water supply could use one. I like the idea of a sprayer or some type setup for water that makes use of gravity. All it takes is a container or bag and some hoses or tubing and a shower head. I hope before the next hurricane hits Florida that I set one up. A shower or bath of ANY KIND is very refreshing and good not only for hygiene, but personal sanity and morale. Wendy, thanks for the toilet riser idea. I have one that is too ugly for my tastes, so I am going to get a tall toilet for the house & put the riser on the Luggable Loo! Roxanne, the one I have is a hard plastic thing round thing. I used to see these toilet seats where they had these steel arms that attached to toilet. Ugh! Neither would I want either to be used every day in my house. I got the plastic one for my dad when he was able to visit. Lol, when my 20 yr old son got a crack in his toilet from dropping a heavy thing on it, he bought a toilet 8 inches taller than previous. Um, he’s 6’4″, so he likes it. You might want to have a box or two of baby wipes. Used them during Iraqi Freedom. You mentioned doing presentations for groups. Do you still do them? 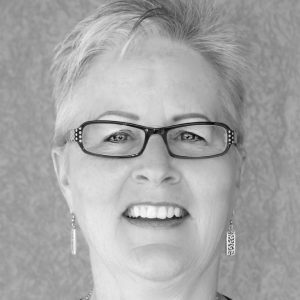 I live in Bear Lake (Idaho) and am the Relief Society President in our ward. I’d love to have you come and do a presentation for our RS group, if you ever travel that far. I read once where you’re from, but can’t remember… but seems like it wasn’t all that far from here. Please let me know if you’d be interested. Thank you!